NICE has issued a draft guideline to set out the most effective way to diagnose asthma and how healthcare professionals can help adults, children and young people better control their symptoms. 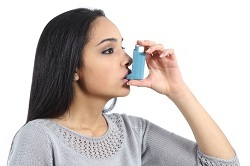 Asthma occurs when a person encounters something that irritates their lungs and causes the small airways to become inflamed and narrow, making it difficult to breathe. Symptoms include breathlessness, coughing, wheezing and tightness in the chest. There is currently no gold standard test to diagnose asthma and in current practice healthcare professionals mainly check for signs and symptoms. However, with almost a third (30%) of people being treated for asthma no longer showing signs of the condition, appropriate diagnosis requires supportive tests. The guideline, published for consultation, stresses that to achieve an accurate diagnosis clinical tests should be used as well as checking for signs and symptoms. The process which the healthcare professional should follow in the initial assessment, and the tests to use, are presented in simple flow charts. The first test should be carried out using a spirometer, a machine which measures how much and how fast you breathe out. Further breath tests should be carried out depending on the results from spirometry and the patient’s age. For adults and young people over 5 years, tests include checking for levels of nitric oxide, a gas which is found in larger volumes in people with asthma (FeNO test), and whether standard medicines which widen the airways of the lung are of benefit (BDR test). The treatment of under-5s should be based on professional judgement and observation until the child is old enough to take clinical tests. Around 1 in 10 of adults with asthma develops the condition because they are exposed to certain substances, such as chemicals or dust, in their workplace. The draft guideline also recommends that healthcare professionals should ask employed people how their symptoms are affected by work to check if they may have occupational asthma. Other key priorities include recommendations for monitoring how well a patient is controlling their symptoms. The draft guideline states that during each review healthcare professionals should check that the patient is able to use their inhaler correctly and also consider using a validated questionnaire so they get a better estimate of how well a person is doing.